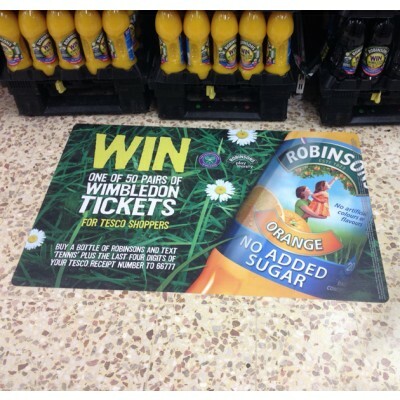 Vinyl floor graphics are hugely effective for retail merchandising & branding - a superb visual display merchandising tool. Floor graphics or decals are equally effective in diverting customers to hot products, floor graphics are affordable and use nil cost space. 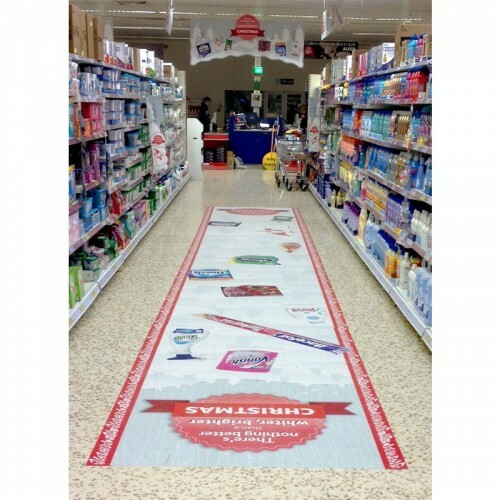 Whether it's a product launch, an exhibition or trade show, or simply a special offer, durable floor graphics point new customers in a direction you want them to go. Floor Graphics are also referred to as floor decals and can be produced in eye catching full colour, in a wide range of sizes and cut to any shape using our state of the art camera controlled cutter. Scuff and slip-resistant, floor graphics will adhere to most floor surfaces. We use large format digital printers which are ideal in producing eye catching, scratch and wear resistant, custom floor graphics. Using vibrant durable high quality HP inks, we get you noticed whether you need one floor graphic decal for your sports centre or 100s to launch a product - with our experience in producing economical signs and graphics we can make your business stand out. Retail outlets aren't the only venue for floor graphics - museums, nightclubs, shopping centres, airports and exhibition halls make floor graphics a must in promoting products providing directions. Other uses include temporary branding of sports events by sponsors and even Health and safety warning in factories. We only use approved materials which are very important in production and printing. Materials must be non-slip and easy to remove and floor graphic decals are ideal for almost any store with smooth, non-porous flooring - acceptable flooring surfaces include vinyl and ceramic tile, sealed concrete and finished hardwood floors. Please call us for full material specifications and samples.